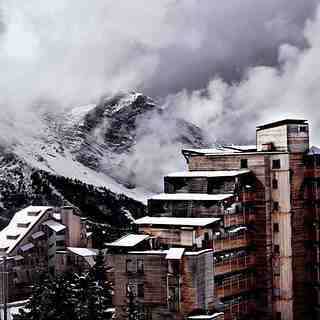 Is it snowing in Avoriaz ?Thank you! How long have you spent in the resort? 1 of 35 Getting There From The Nearest Airport (1) At least one overnight stop, (2) requires a whole day, (3) requires more than half a day &ndash; you may have time for a few turns (4) arrive by lunchtime and ski all afternoon, (5) there is a main airport within an hour of Avoriaz. 2 of 35 Access by Public Transport (1) There are no buses or taxis to Avoriaz, (3) there are slow or infrequent buses / trains available, (5) getting to the resort is easy with frequent bus / train connections. 3 of 35 Scenery (1) An ugly resort in a bland setting, (3) average mountain views and resort, (5) a spectacular setting and a beautiful / historic resort town. 4 of 35 Accommodation Options (1) No places to stay in/near Avoriaz, (3) a few places to stay in the resort, (5) a wide variety of accommodation suitable to suit all budgets. 5 of 35 Cheap Hostels and Pensions (1) No budget accommodation available, (3) just one or two hostels so book ahead, (5) several cheap hostels and pensions available. 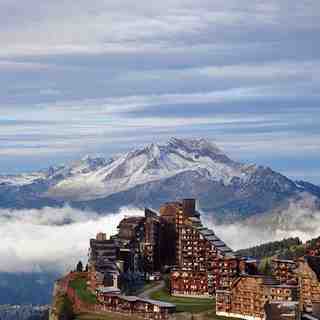 6 of 35 Luxury Hotels (1) No luxury accommodation available, (3) just one or two luxury hotels so book ahead, (5) several up-market hotels in Avoriaz. 7 of 35 Ski in/Ski out Convenience of Accommodation (1) The ski area is located far from any accommodation, (3) a free ski bus takes you to the ski area in a short trip, (5) Ski-in ski-out accommodation is available. 8 of 35 Childcare Facilities (1) There are no child care facilities at Avoriaz, (5) the resort has excellent child-care facilities including at least one reasonably priced creche. 9 of 35 Reliability of Snow Cover (1) Occasionally gets enough snow for skiing, (2) is often closed due to a lack of snow, (3) occasionally suffers from a lack of snow, (4) rarely suffers from a lack of snow, (5) Avoriaz is snowsure even in the poorest seasons. 10 of 35 Snowmaking (1) Avoriaz relies entirely on natural snow, (3) there are just a few snow cannons, (5) there are snowmaking facilities on all pistes. 11 of 35 Snow Grooming and Piste Maintenance (1) There are no snow groomers at Avoriaz, (3) occasionally some pistes are left ungroomed and in a poor state, (5) all the runs at Avoriaz are groomed daily. 12 of 35 Skiing in Cloudy or Windy Conditions (1) there is nowhere to ski when it is windy or visibility is bad and lifts often shut, (3) there are some trees for poor visibility but main lifts sometimes close, (5) Avoriaz is mostly in forest where you can ski in flat-light and windy days, lifts rarely close. 13 of 35 Nearby Alternatives (1) If snow conditions are poor at Avoriaz, it will be poor everywhere nearby, (3) there are good alternatives within an hours drive, (5) other locations on the same lift pass provide a rich variety of snowsure ski conditions. 14 of 35 Regional Snow Condition Comparisons (1) Avoriaz usually has poor snow conditions compared to other resorts in region, (3) has average conditions for the region, (5) usually has the best snow conditions in the region. 15 of 35 Lift staff (1) The staff at Avoriaz are rude or unhelpful, (5) lift staff at Avoriaz are pleasant, cheerful and eager to help. 16 of 35 Crowds and Queues (1) the resort is always busy and there are usually long lift queues, (3) it is quiet apart from occasional weekends and school holidays, (5) it is uncrowded and lift queues are very rare. 17 of 35 Snowboarding and Ski Schools (1) No ski schools available, (2) one or two ski schools but local language only, (3) a few ski schools but book early for multi-lingual instructors, (4) plenty of ski schools and multi-lingual instructors available, (5) excellent ski schools with friendly multi-lingual ski instructors. 18 of 35 Equipment and Repairs (1) Nothing can be sourced, not even ski-wax or ptex. (3) there are some ski shops but rentals need to be booked in advance, (5) good quality ski equipment can be purchased or hired and overnight repairs are possible. 19 of 35 Variety and quality of ski trails (1) The ski runs are featureless and unvaried, (3) the ski runs are varied but not extensive enough for a week, (5) Avoriaz has diverse and interesting pistes including forests and high alpine terrain. 20 of 35 Skiing for Beginners (1) Beginners can only watch others ski and snowboard, (3) a few gentle slopes but beginners will get bored in less than a week, (3) Vast areas of gentle terrain. 21 of 35 Skiing for Intermediates (1) No intermediate terrain at Avoriaz, (3) intermediate skiers will get bored after a few days, (5) vast areas of cruising runs. 22 of 35 Skiing and snowboarding for Advanced (1) Nothing for advanced skiers and snowboarders, (3) enough steep terrain for a few days with some good offpiste, (5) Enough steep terrain and offpiste areas to entertain advanced skiers for at least a week. 23 of 35 Snow Park (1) Not even a kicker at Avoriaz, (3) average sized park quite well looked after, (5) huge park area and expertly crafted pipes, jumps and boardercross trails. 24 of 35 Off Piste (1) No off-piste worth mentioning, (2) off piste is out-of-bounds, (3) some varied offpiste that stays fresh for one or two days, (5) a vast array of off-piste routes that can stay untracked for several days. 25 of 35 Cross-country skiing (1) There is nowhere to go for cross-country skiing around Avoriaz, (3) there are some cross country trails available, (5) the area features many spectacular and well maintained cross-country trails. 26 of 35 Luge and Toboggan Runs (1) No designated luge or toboggan runs, (3) there are toboggan runs that open quite often, (5) Avoriaz has long and well maintained luge / toboggan facilities suitable for all ages. 27 of 35 Mountain Restaurants (1) Nowhere to buy food by the pistes, (3) some places to eat up on the mountain but they are often busy and expensive, (5) there is a variety of excellent mountain eateries right next to the slopes to suit all budgets. 28 of 35 Eating (Within the Resort) (1) Bring your own food, there isn't even a shop. (5) A wide variety of places to eat and drink in the resort, from fast food to fancy restaurants. 29 of 35 Apres-Ski (1) Nothing to do, not even a bar, (3) there are a few bars in the resort but nothing special, (5) clubs and bars stay open until very late and have a friendly atmosphere. 30 of 35 Other Sports Facilities (1) No sports facilities at all apart from ski lifts, (3) resort has just a small public swimming pool, (5) resort has all kinds of sports facilities, including a full-size swimming pool. 31 of 35 Things to do (apart from Snowsports) (1) Besides the snow and walking there is nothing to do here, (3) the non-skier will find things to do for few days but may become bored after a week, (5) the resort area is a fascinating place to visit, regardless of winter sports. 32 of 35 Winter Walking Trails (1) Very limited walking and no snowshoe trails, (3) a couple of designated scenic walking/snowshoe trails, (5) extensive and diverse winter walking trails for all abilities. 33 of 35 Lift Pass Value for Money (1) A 1 week ski pass is overpriced compared to the number of lifts available, (3) the ski pass is averagely priced and covers a reasonable number of lifts, (5) ski passes are excellent value for money and cover a lot of lifts spanning a big area. 34 of 35 Overall Value for Money (National Comparison) (1) Overall, Avoriaz is one of the most expensive ski resorts in the country and not worth the money, (3) overall represents average value for money, (5) overall offers the best value resort in the country. 35 of 35 Overall Value for Money (International Comparison) (1) Overall, Avoriaz is one of the most expensive ski resorts in the world, (3) overall it offers pretty average value for money compared to resorts from other countries, (5) internationally the resort offers excellent value for money.